Some merchants may want to include a payment option that only applies to their phone orders. This payment method's function is not necessarily to collect payment, but rather to simply allow the phone order to be processed on the store while actual payment is collected by other means. For example, you may use the 3dcart store's phone order system to create orders for walk-in business - where the shopper is paying in cash or perhaps it's an order where the true payment is collected by your brick and mortar store's card reader instead of the store's integrated payment options. Either way, the phone order needs a payment method that will let the order go through to creation - even though the store itself isn't collecting the actual payment. 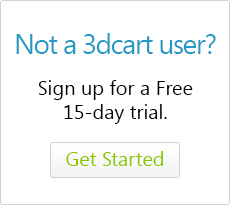 Fortunately, your 3dcart store can allow you to do this with ease! The following steps will show you how to add an offline payment method that will simply let the phone order go through to completion. Furthermore, the payment option will ONLY apply to orders started in the store's Phone Order function. Fill out the rest of Payment method's information as needed. Now for the most important step - making sure that this payment method only applies to phone orders. Using the payment method's "Cust. Group" drop down, select "Phone Orders"
The option is entirely up to you for however this phone order is being used for your business. For example, if the above scenario applies to a cash-only type of order, then you would likely want to place the order into "New" status so that it can be processed as normal. However, if the above scenario is for a check or money order type of order, or an order in which payment isn't collected at that very moment (i.e. Invoice or C.O.D.) then you will likely want to have the order placed in "Unpaid" status while you await payment collection.